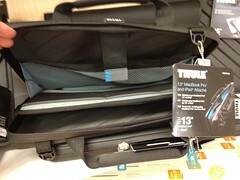 I have the Thule 13" MacBook Pro + iPad Attaché carrying case. This case is awesome and very nice looking. Thule typically makes luggage equipment for mounting atop vehicles, so their look is more on the side of "functional" not "pretty". The case is water resistant with a zipper that closes firm. It think it is designed to be carried in various weather conditions without fear of moisture reaching your devices, not designed to be submerged completely in water. 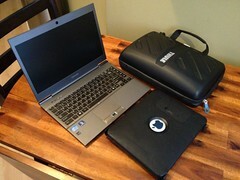 While it is designed for a MacBook Pro, I carry my Toshiba Ultrabook inside it. 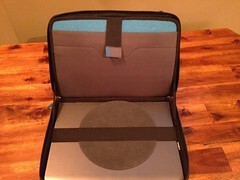 The case opens in a clamshell with a laptop side and another for an iPad and storage for accessories. On the laptop side, there is simply a elastic band that holds the laptop firmly in place. 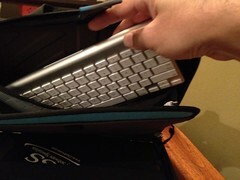 You can open and close the case without fear of the laptop shifting or falling out. 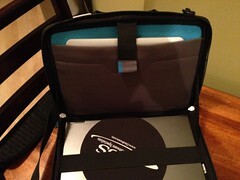 It is designed so that you can open up the case and position the laptop to be used in the case. The other side is nicely designed. 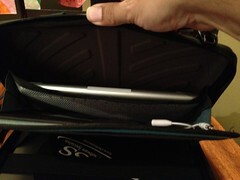 There is a section divider that holds the iPad in the front side pocket. 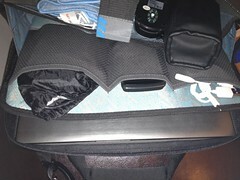 The divider has three pockets on the back where you could store an iPhone, USB drive, on any other small devices. Behind the divider is a huge storage area that can easily store power cords for both your laptop and iPad. There is room enough for an Apple Bluetooth keyboard, a mouse, cleaning cloth for your iPad screen and whatever else you might need while on the go. 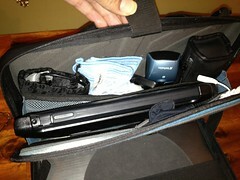 There is a strap that is attached to the back cover of the case that has a Velcro patch to lock unto the divider. This strap ensures that everything in the storage area stays put. While I am using my Apple Bluetooth Keyboard to write this review on my iPad, I typically don't carry it with me. I typically don't mind using the on screen keyboard, but it is nice to know it is can be brought along in my case if I needed to do so. I compute to work using the bus system. I park my car and then board the single bus that takes appropriately 45 minutes to arrive to Downtown Detroit (Michigan). Using a Bluetooth keyboard is not practical in this environment. I am; however, able to store everything I need do need in this case. My naked iPad could very easily slip into the front pocket of the divider. The pocket has a soft liner so that the screen would not be scratched. While the pockets are nice on both sides of the divider, I typically do not use them. My iPad (first generation) is in an Otterbox case, so it is bulkier than it would be without the case. I place it between the divider and the storage area and secure it in place with the Velcro equipped strap. 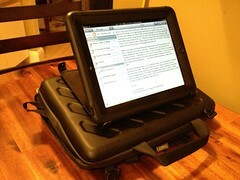 The Otterbox case protects the iPad from everything else that is in the bag. When I am computing and want to use my iPad, the Thule case works great as a flat surface to rest my Otterbox case on top of. I prop my iPad up on the Otterbox's stand and can comfortably use it. 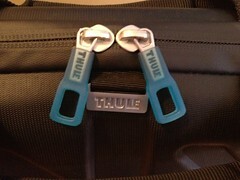 The Thule case has a removable shoulder strap that come in handy when I use the case as a surface. What I do is unstrap one side of the shoulder strap and wrap it around my waist and then reattach it to the case. This secures the case and prevents it from sliding away from me, since I am at the mercy of the bus driver and made experience some sudden and abrupt stops. I often use this method with either the iPad or with my laptop. In both instances, the textured and patterned surface of the outer case shell is perfect to help keep the device from shifting while in transit. 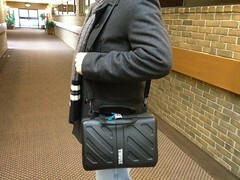 The Thule 13" MacBook Pro + iPad Attaché carrying case holds everything I need while on the go. The storage area is a nice size. 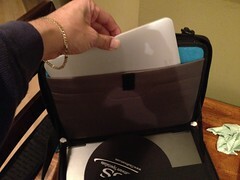 It has a mesh pocket that runs the length of the case and will keep you items in place. OrigAudio ROCK-IT Portable Vibration Speaker 3.5mm USB! 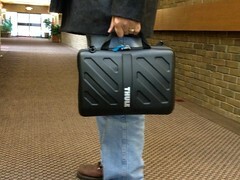 The Thule 13" MacBook Pro + iPad Attaché carrying case is a perfect size case for me. It is 13.6" wide, 10.2" high and 2.2" in depth. Those dimensions don't seem big at all and by appearance they aren't, but they are quite adequate to allow everything I need to be brought with me while on the go. I like that is is not a huge carry case. I used to wheel a bag behind me in order to bring all the things I needed for my mobile office. You don't believe me!? 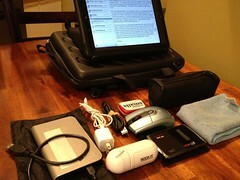 Take a look at the video I submitted to the Gadgeteer's "Show us What is in your Gear bag?" contest. I didn't win the contest and received a T-Shirt for my efforts. Here are all the other entires. Maybe I would have won the contest if I had this bag, but I definitely would have one if I had today's devices in it. None of these items were even available back in 2006. The funny thing is that I basically have the same equipment, but at smaller footprints. The two things that would technically be in my bag today are my White Apple iPhone 4s 32GB At&t White and my LG Tone (HBS-700) Wireless Bluetooth Stereo Headset , but they are on my belt and neck. This bag is a great size. It is the right size for everything I need without looking big and bulky. If you looked at this case, you would never think it held so many items. The case is not flashy or colorful, so it does not draw much attention which is great while commuting. It does have a very prominent THULE logo on the front, but that name doesn't scream "Expensive Gadgets Inside!". 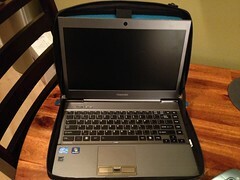 I purchased the Toshiba 12-Inch Leather Envoy Leather Case with my Ultrabook, but this thing was just too big and heavy. When travelling or computing, I want my bag to contain what I need without taking up too much space. I can use the strap to hang this on the seat in front of me without taking up too much of my leg or lap room. While flying, this can slide under my seat with room to spare. 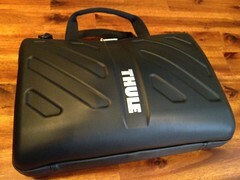 I highly recommend the Thule 13 Inch MacBook Pro Laptop Attache Case . It is a rugged, yet sophisticated looking case. Its durable, semi-rigid, high-density construction provides protection for the hardware you need to carry. The case cost $79.99 USD. All photos can be viewed here on Flickr.